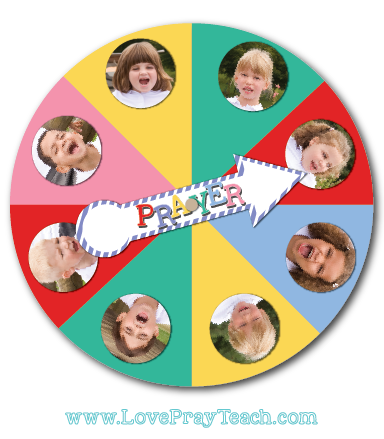 Free Classroom Prayer Chart Spinner! You are here: Home » Blog » Free Classroom Prayer Chart Spinner! When teaching Primary age children, one of the most challenging things for me is how to choose who says the opening and closing prayers! I know it sounds kind of silly, but I never want a child to be left out or not asked to pray just because they don't volunteer. I recently had a cute little CTR 5 class that had 6 children. Out of the 6 children only 2 ever volunteered to pray. And they were very adamant about getting to pray each week! Having some sort of a chart or rotation for who gets to say the prayers is a great idea! But if you're like me, you might not remember who said the prayer the week before and who's turn it is next! 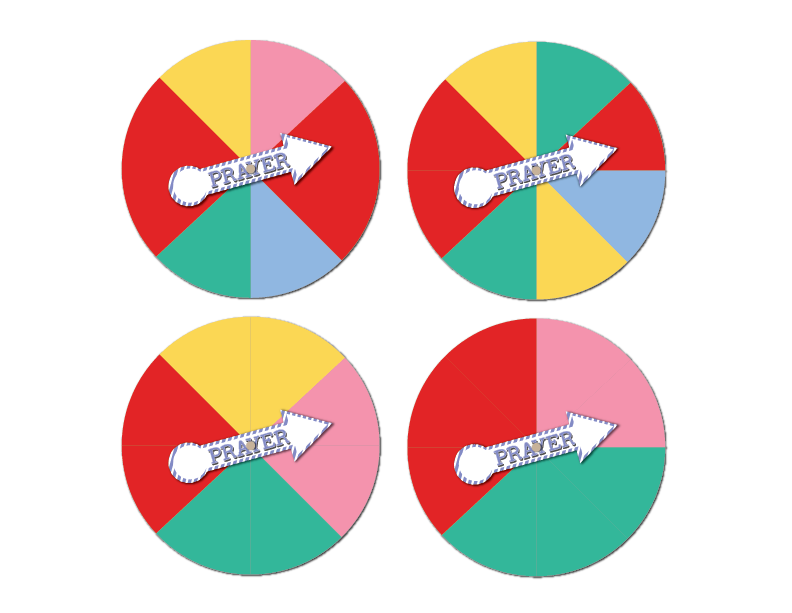 So I created this fun prayer chart spinner to solve the problem! This is super simple to make and can be used over and over! You can use pictures of the kiddos like I have in the above example or just write their names in the triangles. If you use pictures, 1.5" or smaller will fit perfectly. There are many ways you can arrange the triangles to fit the number of children in your class. Just print as many triangle colors as you need to fit on the circle. If you have more than 8 children, you could cut the triangles in half or use 2 spinners - one for the boys and one for the girls. I've also included blank arrows if you'd like to use this spinner for other activities in your classroom! Print the circle, spinners, and triangles on cardstock or heavier paper. Cut out the number of triangles you need and glue them onto the circle. Punch a hole in the middle of the circle and the prayer arrow. Make sure the hole on the arrow is bigger than the brad. You want it to spin nicely! Place a brad through the arrow and the circle. You don't want the brad to be tight against the paper. Fold the ends of the brad but leave wiggle room for the arrow to spin. That's it! 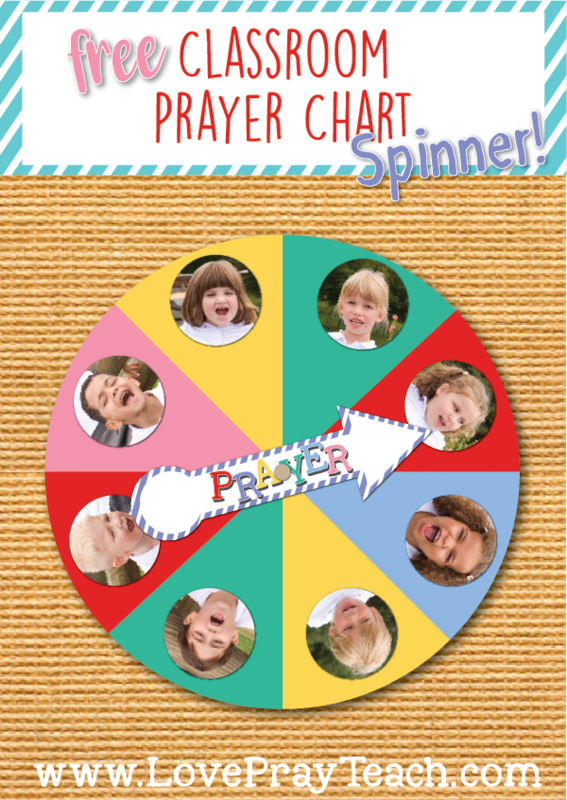 Now introduce it to your classroom and let them have fun spinning their new prayer chart!